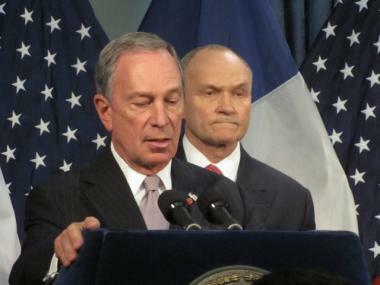 Mayor Michael Bloomberg and Police Commissioner Raymond Kelly delivered the results of an sting operation targeting illegal gun sales at gun shows, on Oct. 7, 2009. Mayor Michael Bloomberg, a notorious crusader in the national fight against illegal guns, is back at it again, this time with an announcement on Wednesday of an undercover sting operation targeting illicit gun sales. Forty private investigators hired by the city spent four months infiltrating gun shows in Nevada, Ohio and Tennessee to prove that the so-called "gun show loophole" is a very serious matter. The sting, called the "Gun Show Undercover," revealed the majority of sellers at gun shows were willing to sell guns to people who admitted they could not pass a background check. Federal law stipulates that guns cannot be sold to anyone who gives the seller reason to believe they could not pass a background check, but private sellers are not actually required to conduct these checks. “The gun show loophole is a deadly serious problem—and this undercover operation exposes just how pervasive and serious it is,” Bloomberg said in a statement. The mayor and Police Commissioner Raymond Kelly stressed that New York City is still on track to have the lowest homicide rate in almost 50 years, but the weight of recent gun violence was evident. Sixty three percent of gun sellers approached hawked guns to undercover investigators posing as buyers who said they could not pass a background check. Ninety four percent of those the investigators encountered sold to “straw purchasers." Straw purchasers are people who step in to fill out the paperwork but are not the actual gun buyers. The investigators were able to buy 36 semi-automatic handguns and two assault rifles. Bloomberg has made his record against gun violence a campaign issue, and the findings were released exactly one month before the mayoral election. The mayor has been an active member of the fight against illegal guns since taking office, founding the national organization “Mayors Against Illegal Guns” and lobbying for the repeal of the Tiahrt Amendment, which restricts the access of local law enforcement to information the Bureau of Alcohol, Tobacco and Firearms (ATF) has on illegal gun trafficking. Bloomberg has provided the ATF with the full report and plans to send copies to every member of Congress in the hopes of persuading them to pass legislation that will close the loophole. Several states, including New York, have already passed legislation to close the loophole, but the mayor believes that until it is federal law, New York and other cities will suffer.